It was with great anticipation that I put my moth sheet out a couple of nights ago. Although temperature was supposed to peak over the weekend, the moths didn’t know that, and Thursday was the first really warm day we’d had in some time. I was delighted (if not surprised) by a good diversity of moths to the sheet, probably over twenty species once the micromoths are factored in. At least half of the macromoths were new-for-season. Many familiar faces, which is always pleasing. Another familiar face, perhaps less pleasing to see arrive, was the first Giant Water Bug of the year. Followed shortly by another. And then a third. There were half a dozen or more by the time I shut the light off, all clumsily clambering over the dried grass and dead leaves. 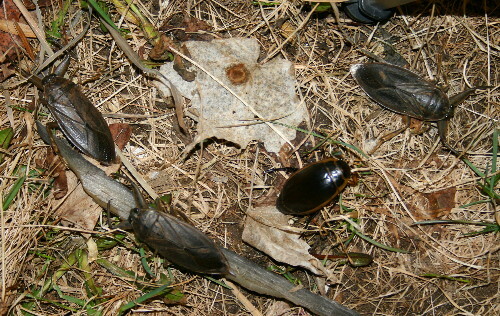 A few fell into the window well, where they remained into the next day and following evening. It baffles me that we can get so many of these things at this house, with no water bodies within visible range of the house, when at my parents’ old place I’d see just one or two, despite the big swamp and vernal ponds just a short distance away. I was surprised, however, by the appearance of an unfamiliar individual who came to join the party. 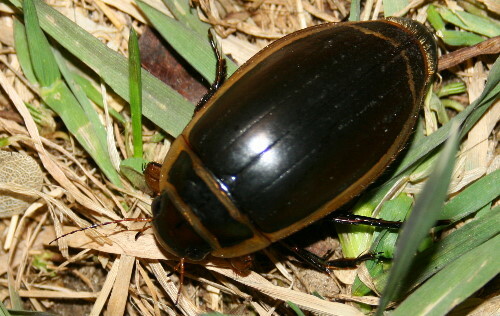 While the Giant Water Bugs are, as their name says, true bugs, this one was a beetle. Clearly also attracted to light, and, though you can’t really tell from these photos, the broadly flattened hind legs indicate it’s also aquatic (they’re used like oars to propel the beetle through the water). I think this is a species of Dytiscus, perhaps D. cordieri. Telling the different species apart often requires examining the pattern on the underside, though, something I didn’t know at the time I was photographing it. The largest of these species can be over 4 cm (1 3/4″), though most species are slightly smaller than that, 2.5 to 3.5 cm (1 to 1.5″). They live and feed in fresh water, particularly favouring ponds with emergent vegetation such as cattails or reeds. The larvae are also predaceous and aquatic, and those of the largest species are capable of taking vertebrates such as tadpoles or minnows. 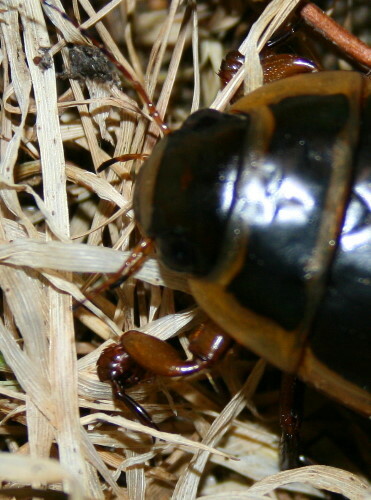 Males have round pad-like front “feet” (below), which I presume are used to grip the female during mating. Is that your first beetle of the season?